We start with some wonderful film taken at Blackbushe in 1959; Falcon, Continental, Orion, Pegasus and Eagle Vikings, Dan Air Yorks, Bristol Freighters and Ambassadors and lots more, all in colour, as is the rest of this DVD, of course. 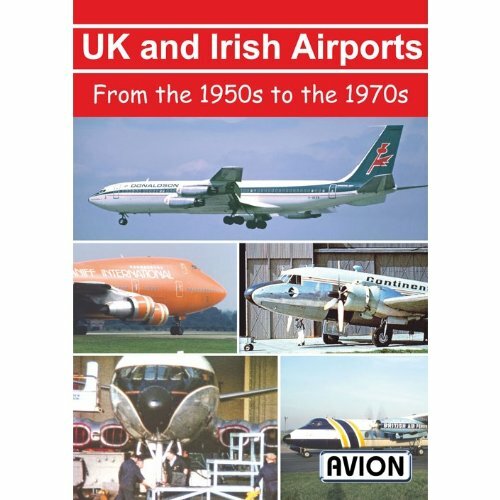 Then were off to look at many UK Airports, 12 in all, plus Dublin and Shannon, during the next couple of decades. Among the regional airports are Liverpool with British Eagle DC4s and arrivals at Cardiff for a Rugby match that include a Catair Super Connie and a Trans-Union DC6. Heathrows not forgotten; theres a fascinating visit to BOACs maintenance hangar with 707s, Comets, DC7C, Britannia and VC10. Remember BOACs only CL44 Its here too. Two trips to Southend reveal lots of Carvairs, BAF Heralds, BMA Viscount, etc. Prestwick has a good mix of sixties jetliners and military types, refuelling before making their Atlantic crossings. 707s and DC8s are seen at Manchester too, along with a BOAC 747 and an Aer Turas DC7. Luton has Britannias of course and more 707s. Fancy a seat on the flightdeck of a BEA Airtours Comet or a trip in a Transglobe Britannia No problem, theyre just part of two visits we make to Gatwick. Right at the end, we have a quick look at Shannon and Dublin in the 1980s with Aer Turas DC8 and CL44, Ryanair 748 and 1-11s and more!